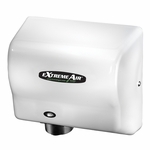 This bright polished chrome soap dispenser provides a top-filling design for ease of maintenance and labor savings. It also has a vandal-resistant, corrosion-resistant, locking cover and free-turning spout. Capacity: 34-fl oz (1.0-L).